New Hampshire's Premier Music Store! D-28 or HD-28? What are the differences? Have you ever wondered what the differences are between these two nearly identical looking Martins? There is one major structural difference and a few cosmetic details that are important to note when you are deciding which Martin Dreadnaught you wish to purchase. It is important to remember that tone is subjective and each model will appeal differently to everyone depending on their playing style or tonal preferences. When buying a Martin or any guitar, we recommend playing it first! We generally have both models in stock at all times. The biggest difference between the HD-28 and the D-28 is the top bracing. All acoustic guitar tops are supported by smaller wooden struts, known as braces, located underneath or inside the guitar. They are responsible for reinforcing the top and helping it withstand string pressure and distortion. Many different bracing “patterns” have been used over the years – X shaped braces were introduced in the mid 1800s and many future patterns were derived from this style. You may have also heard of “ladder bracing” “scalloped bracing” and “parabolic bracing”. 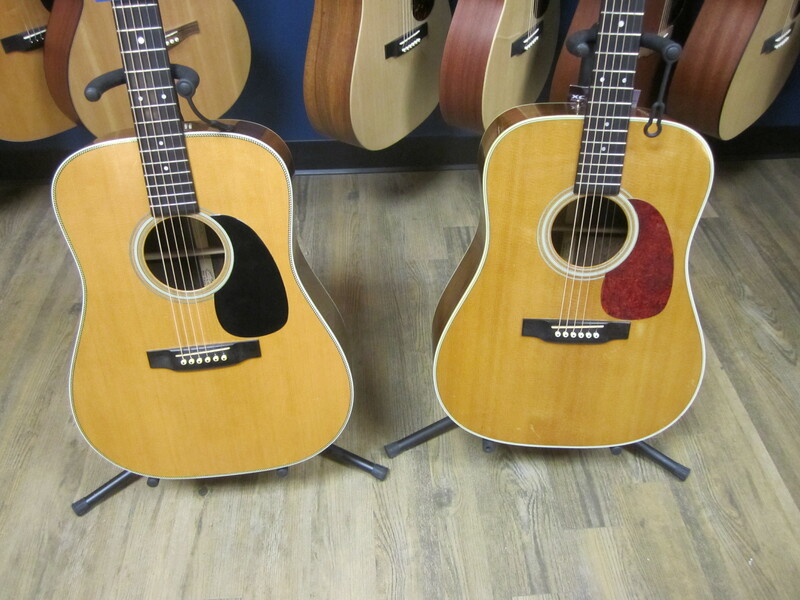 So, on our right, we have a 1965 Martin D-28 with Brazilian rosewood back and sides. (Currently available for sale but it won’t last long!) The D-28 features “Non-Scalloped 5/16” top bracing. These braces run straight across the top and are the same width throughout, unlike scalloped braces which are carved out in the middle to form what might best be described as an elongated “half-pipe” shape. We will get to these later though. The non-scalloped braces on the D-28 give it a specific sound. It makes the guitar punchy, directional, and gives it a more rounded sound overall with less low end and more balance. The HD-28, like this 1985 pictured above, features forward shifted scalloped braces. Pre-war Martins used this bracing system as it was thought to “open up” the sound, since the top is able to vibrate more in conjunction with smaller, “scalloped out” braces. The sound of the HD-28 can be described as booming, atmospheric, harmonically rich, and “big” sounding. Cosmetically, the HD-28 features a herringbone binding, while the D-28 has a white binding. The HD-28 also generally has a tortoiseshell pickguard, while the D-28 pickguard is black. Both guitars have solid Sitka spruce tops and solid Indian rosewood back and sides. They both have mahogany necks with an identical profile, and both have ebony fretboards. So now it just comes down to your preference, and what you like in an acoustic guitar sound. If you like a more focused, more intimate sounding guitar that is balanced across the frequency spectrum, I would recommend the D-28. If you like a guitar to sound as big as possible, and want every harmonic to ring out, you would probably prefer the HD-28. Martin also makes an HD-28V, which has a modified V shaped neck profile for an even more historically accurate guitar. We are a proud and authorized Martin dealer so come by and check out some new Martins – remember we offer great prices on special orders too! This entry was posted in Uncategorized by manchestermusicmill. Bookmark the permalink.